Another lamp designed more for appearance than function. 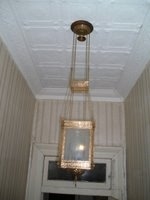 Hall lamps were designed for entrance foyers and halls of wealthy households. They are the only style of lamp which was never made as a central draught lamp with a small glass font with a single wick 'E' burner being inside the base of the lamp. These shades are typically cranberry however other colours include clear, blue and green. 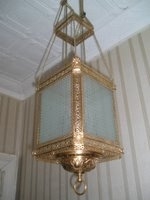 This style of lamp was also designed in a square shape with detailed etched glass panes in square brass frame making up the shade as well as cheaper versions with plainer brasswork and simple clear or coloured shades. These lamps also used a unique system to light them. Although not adjustable (that is they have a ‘set’ height) they were lit by pulling the base ‘pull finial’. By doing so the base of the lamp, including the small glass font would lower. The chains, connected to the base by two arms hidden inside the shade would pull over the pulleys situated in the ceiling canopy. As the other end of the chain is attached to the shade by the hanging ring, pulling down on the pull-finial causes the shade to rise, thus exposing the font for filling and lighting. Once lit, the weight of the shade will cause the process to reverse and the base will again lock into the shade securely. This design negated the need for either a ceiling clutch or counterweight. Etched cranberry shade with fully embossed brasswork. Etching on the shade depicts a series of palm trees with elephants (with tails and trucks linked). A decorative hall lamp with original pink swirl shade and embossed brass fittings.